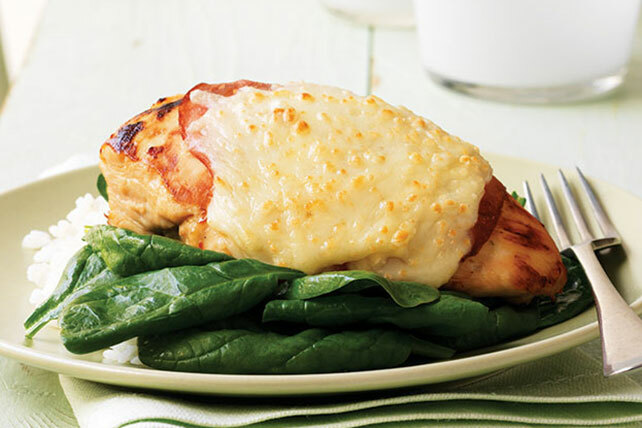 Topped with ham and cheese and seasoned baby spinach leaves, this Chicken Florentine is as impressive as it is delicious. Heat 1 Tbsp. dressing in large ovenproof skillet on medium heat. Add spinach; cook and stir 1 min. or just until spinach is wilted. Remove from skillet; cover to keep warm. Add remaining dressing and chicken to skillet; turn chicken over to coat both sides with dressing. Cook 5 to 6 min. on each side or until chicken is done (165°F). Top chicken with ham and cheese; cover. Cook on low heat 1 to 2 min. until cheese is melted. Serve over spinach mixture. For a simple, yet elegant, weeknight dinner, serve with hot cooked rice and a tossed green salad. Substitute 8 fresh asparagus spears, cut in half, for the spinach. Heat dressing in skillet as directed. Add asparagus; cook and stir 5 min. or until crisp-tender. Remove from skillet; cover to keep warm. Add remaining dressing and chicken to skillet. Continue as directed. Prepare using KRAFT Shredded Low-Moisture Part-Skim Mozzarella Cheese.